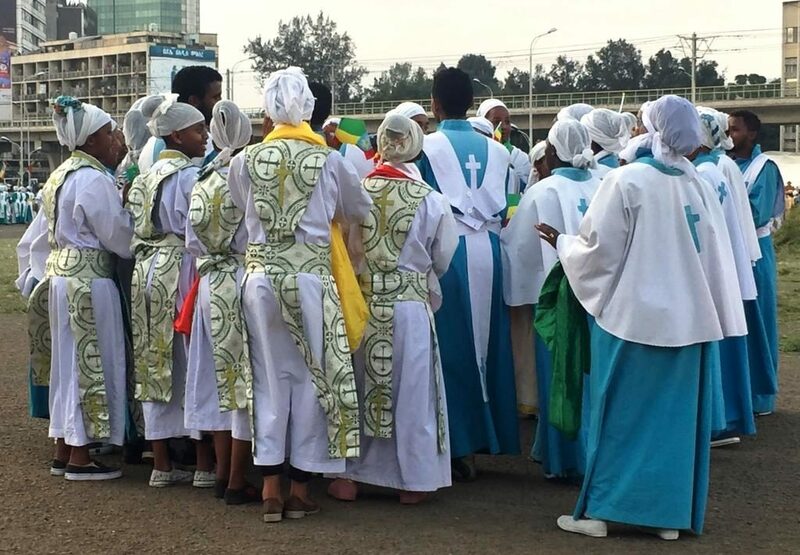 What is the connection between Ethiopianism in South Africa and the Ethiopian Orthodox Church in Ethiopia? 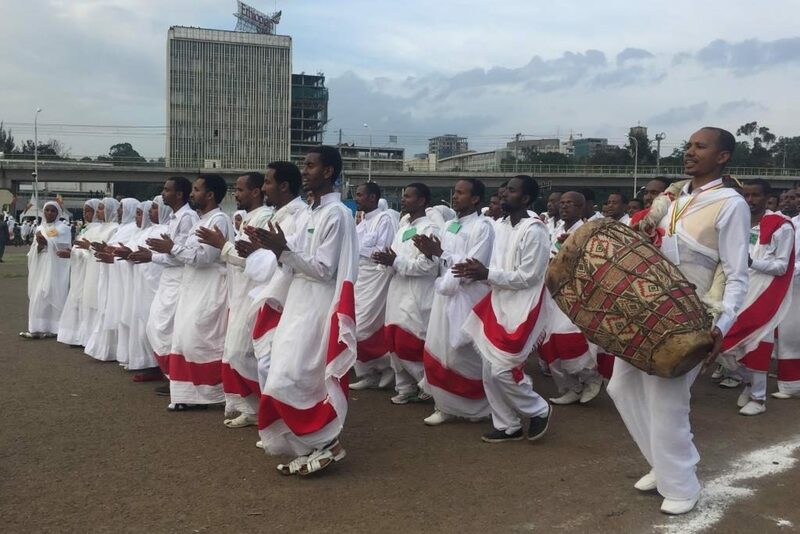 If any of you have ever thought about the connection between the Ethiopian Church in South Africa and the main church in Ethiopia: the Ethiopian Orthodox Tewahedo Church, you have a more inquiring mind than I do! (Nearly half of Ethiopia’s population of 102 million are members of the Ethiopian Orthodox Church). I had the privilege of leaving Liz at Lancaster for just over 2 weeks last year to visit Ethiopia – a destination which had long been on my bucket list. What an amazing country on so many levels. The visit was planned to coincide with the Meskel Festival on 26th September (celebrating the Finding of the True Cross). 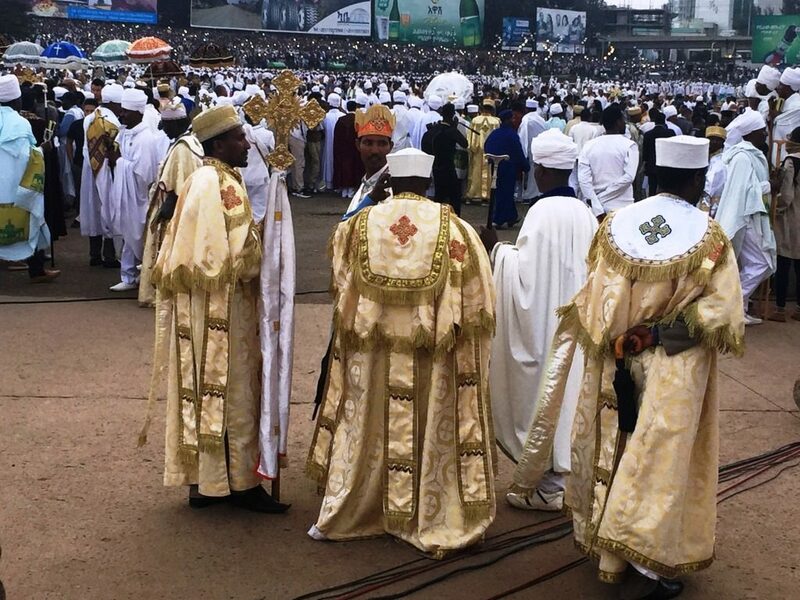 For 4 wonderful hours we were part of a huge crowd who listened to the Patriarch of the Ethiopian Orthodox Church and the various Archbishops and political leaders speak, while waves of members of the different congregations swirled into Meskel Square accompanied by drums, music, dancing and ululating. It was mesmerizing. 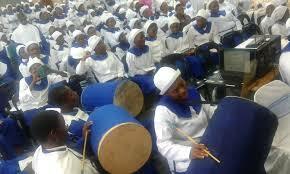 And many of the white uniforms with green and blue sashes, belts and collars, reminded me of the Independent Churches back in South Africa. And it got me thinking about the Ethiopian Church in South Africa and its relationship to the Zionist Christian Church (ZCC) as well as the small independent church groups that celebrate in the various parks and open spaces in Johannesburg. Stay at our well located Guest House and find out more about African religions. View our Johannesburg Guest House for Rates and Availability! And I realized that to say that was I hazy about their origins and histories and the connection between them, was somewhat of an understatement. So I started to do some research. And here’s what I have come up with in a very simplified and summarized form. and others smaller informal ones who worship outdoors. Ethiopianism grew out of mission congregations such as the Anglican, Wesleyan, Congregational and Methodist churches and schools. These produced an educated elite, many of whom became middle class and had the skills and training to adapt to entrepreneurship and urbanization. There was a lot of dissatisfaction amongst many black congregants as, despite Christian teachings of equality, there was significant racial disparity within these congregations. This led to breakaways by African church leaders with the cry of “Africa for the Africans”. The breakaway churches identified with Ethiopia as a symbol of independent African-ness as well as a symbol of African unity. These breakaway Ethiopian churches kept close to the theology and the practice of the mission churches from which they seceded. But in their stand against discrimination and in their support of the improvement and upliftment for their clergy as well as their congregations, they were a middle class protest movement. It was this aspect of resistance, as well as the political edge of the emphasis on African unity (over tribalism), that was seen as a threat by the colonial government. Whereas Ethiopian separatism grew out of local mission congregations and aspired to a pan-Africanism, the independent African churches had very different origins and took a different direction. The origins of Zionism are complex. A disaffected Dutch Reformed Minister Petrus Le Roux, was interested in the teachings of Dowie from the Christian Catholic Apostolic Church in Zion City near Chicago in the United States. 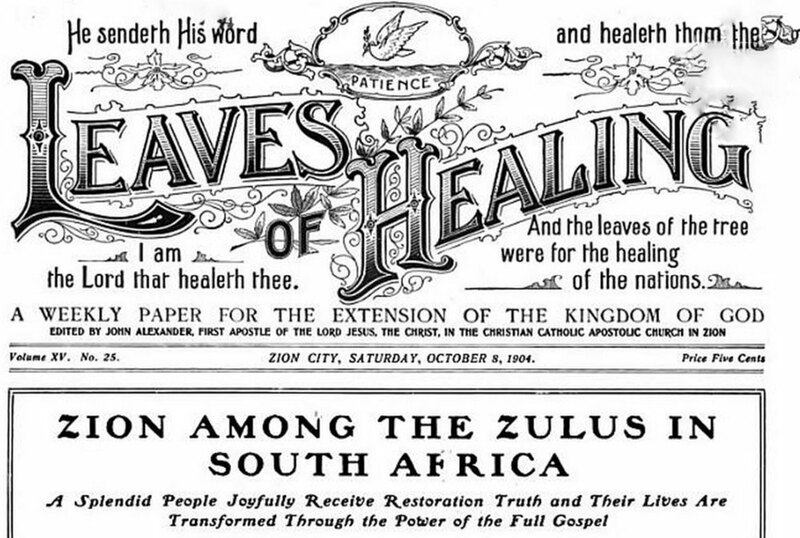 In 1903, Le Roux, along with 400 Africans, started the first Zionist Church in Wakkerstroom based on Dowie’s teachings (which stressed the importance of divine healing). This direction was given further input with the arrival in 1908 of missionaries from the American Pentecostal and Apostolic churches . Pentecostalism is based on the Book of Acts (Chapter 2), where Christ’s disciples were baptized in the Holy Spirit with the accompanying speaking in tongues, prophecy and healing as signs of the baptism. 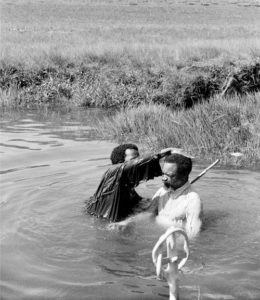 In a belief system where ancestral spirits “speak” to believers, a religion where baptism takes place together with “speaking in tongues” and the holy spirit offers divine healing, it was easy for Pentecostal Zionism to attract new converts. While the Ethiopianism was a largely middle-class protest movement, Zionism adapted to the needs of the poor proletariat emphasizing healing rather than political involvement. With the removal of land from black farmers as well the introduction of migrant labour for mines and urban industry, there were huge numbers of transient ‘homeless’ displaced people with no support or family infrastructure in the urban centres. It was the Zionist movement which provided a home for this poor and illiterate working class. In this a-political stance, the Zionist movement did not pose the same threat to the colonial and Apartheid government as the Ethiopian churches were seen to. Since its inception Zionism has developed a huge number of offshoots so that there are now well over 4000 churches with an estimate of 30% of the total South African population being a member of an African Independent Church. 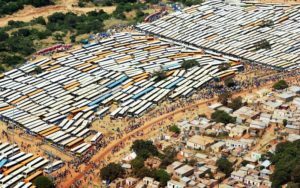 The main Zionist Church is the Zion Christian Church which has some 6-8 million members in South Africa and has its annual pilgrimage to Moria near Polokwane every Easter. « In Jozi it’s happening all over the place!